Read the instructions carefully to familiarize yourself with the rules. You may lay out tape on the ground in the shape of the deck of a ship if you like (at least 15 yards x 10 yards), although it is not necessary. 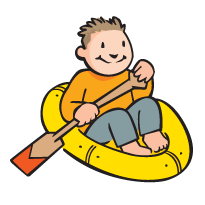 Ask your students if they have ever been on a boat before. Are there any special terms that sailors use while they are on their ship? Make a list of any terms that your students come up with. If they are unfamiliar with any nautical terms, tell them that you’ll be teaching them some as part of this game. Can you be the last sailor standing on this ship? Listen carefully to the instructions, and do just as the captain says! This game is played with the entire group of children together. Before the game begins, explain to the group that you are all on a ship and that there are certain instructions which everyone will need to learn before you can head out to sea. Show your students the area that makes up the ship – this can be a clearly marked space (you can make the shape of a ship with tape on the ground) or just a general area, but make sure that it is at least 15 yards long and 10 yards wide. All of your students need to fit on this “ship” and have some room to run around. Begin by pointing out the 4 sides of the ship they’ll need to be familiar with (bow, stern, port and starboard—see below for more). Send them all to the stern (the back of the “ship”—you should be standing at the bow, which is the front), then have them come back to the bow. For this first round, you will stand at the front of the group and you will be the “caller”. Everyone must do whatever the caller says. Next, give your students the other instructions which they’ll need to follow (see list below), and end by explaining the most important rule—what to do when the captain is coming. When the caller yells out “Captain’s Coming!”, it means that the captain is on the ship, and the group needs to stand at attention, saluting her/him. When everyone is standing at attention, no one is allowed to move until the caller says “at ease”. If the caller gives an instruction while the group is at attention, and the caller has not said “at ease” yet, then anyone who moves is out of the game for that round. This is where careful attention to what the caller is saying is really important. Just like in the game “Simon Says” where the caller can try to trick players by giving commands without saying “Simon says”, the caller in this game can yell “Captain’s Coming!”, then try to give another command before saying “at ease” in an attempt to fool the players. With “Rowboat”, “Lifeboat”, and “Octopus”, if there are odd numbers, those in odd numbered groups are out of the game. Ex. If you find an octopus with 7 or 9 people in it, the whole group is out (life is tough on the open sea…). Any sailor who does something different from what the caller said is out of the game. When there is 1 player left, the game is over. If there are several players left and it seems like it will be too difficult to “trick” them, you can also declare multiple winners and end that round. For some of the commands, like “Jellyfish”, children may prefer not to get down on the ground – come up with an alternative way of acting that command out (for example, children can act like they are “floating” around the room, just like jellyfish “float” in the water. After playing once, gather everyone together to talk about the game. Was it easy or hard to remember the instructions? What was their favorite command to do? Play the game again with you as the caller, or reward the last round’s winner by asking if they would like to be the caller. After players have mastered the basic commands, you can try adding new ones. Ask you students to come up with some new commands, but stick with the theme of being on a ship! Captain’s Coming can easily be adapted to teach children vocabulary from other content areas. Instead of being on a ship, maybe children need to learn North, South, East and West. Add commands where they have to act out meteorological terms (ex. the command “Cloud” might have them “floating” around the room; “Hail” might have them stomp their feet loudly on the ground, and “Storm’s A-Coming!” might have them hold their arms over their head like an umbrella, not able to move until the caller says “the storm has passed”). There are lots of variations you could try – be creative!